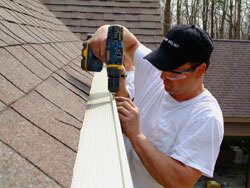 The growth of moss, mold, and mildew can shave years off the life of your roof. The accumulation of moss and other flora on your roof can cause your roof tiles and shingles to deteriorate at a much faster rate than normal. Not only is moisture retained above the shingle it can cause moisture to form between your shingles and roof tiles resulting in the deterioration of the shingle and can even cause the growth of mildew and mold underneath the shingle. Moss is not a plant but a fungus and has a virulent root system that can seep into the most minute of openings causing it to decompose. Safeguard Chimney, Roof and Gutter will remove the moss and other foreign material that is accumulating on your shingles, shakes and roof tiles preserving the life of your roof. In order to preserve the life of your roof it is essential that moss and other foreign material be removed from your roof before they do irreversible damage. Safeguard Chimney, Roof and Gutter will carefully remove the moss, mold and mildew accumulating on your roof, increasing the life expectancy of your roof by as much as 8 years. We will also then treat your roof to prevent the future growth of moss, mold and mildew from your composite shingles, shakes and roof tiles allowing you to go longer between cleanings.